The boys recently discovered Super Mario Brothers for Nintendo Wii. It’s so fun watching a new generation enjoy the game. It brings back memories for both me and Angela of our childhoods. 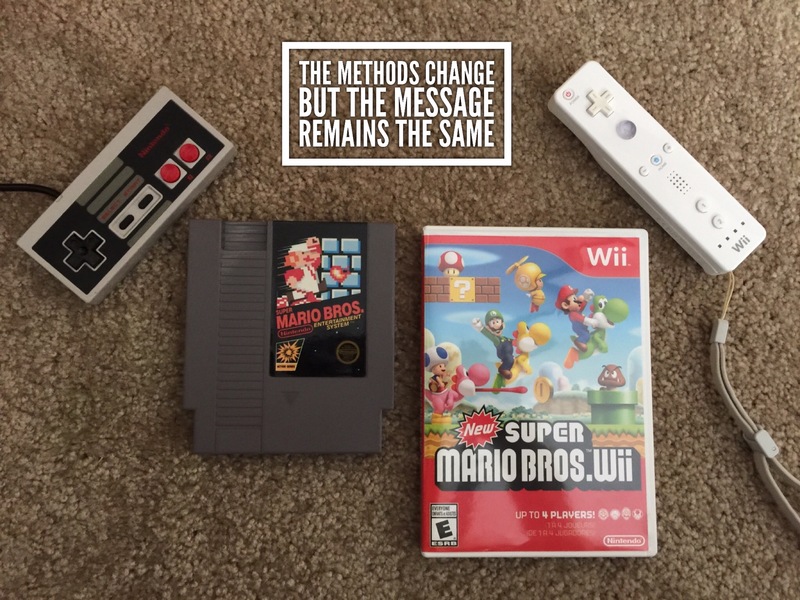 We actually still own the old NES (Nintendo Entertainment System) and pull it out on rare occasions to relive “the glory days.” And we also have a blast learning the new twists and turns of the Wii version. Though there are a few new characters and a few new tools and a few new play areas, the goal is still the same… rescue Princess Peach. Characters still basically operate the same, and you still move left to right on the screen. And then it hit me yesterday that our goal for believers is still the same today as it was 30 years ago, 500 years ago, even 2,000 years ago. The mission & message are still the same today… It’s just that some of the methods are new. Just like the boys use a different machine, the graphics are a lot clearer and the controller is more responsive yet they are still playing the same basic game, so we as believers today have some pretty sweet new ways to present the same great message, the same Good News… Jesus came to pay the price for everyone’s crimes against God so that we could go free and become a part of God’s family forever! We may use social media or movies to convey the Good News instead of standing on the street corner preaching or holding a massive crusade under a tent, but the truth remains the same. Jesus still transforms us from sinners to saints. Sure, it’s fun to go old-school every once in awhile with Nintendo and in sharing Jesus with others . But I’m having fun learning some new ways as well… like flicking the Wii remote to fly and like blogging what’s on my heart. I love that Jesus is the same yesterday, today and forever (Hebrews 13:8). And whether you’re school or new school, those of us who love Jesus are all on the same mission. Now I have to quit typing and give my thumbs a rest… gotta save up some skills to show those boys a thing or two!